This recent addition to the Vancouver Transit Art Installation series captured my eye and brain when I was downtown yesterday. 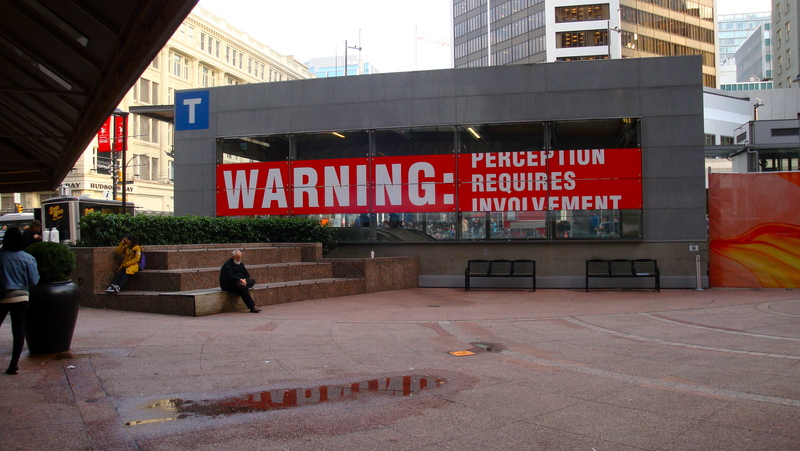 It is one of a series of conceptual artworks by Antoni Muntadas hosted by the Vancouver Art Gallery (VAG). I encourage you to do so, but you may or may not choose to read the VAG’s writings by Ms. Campbell (below) about this artist and his work; however, when you looked at these photos you probably had some form of personal insight or understanding as to the installation’s meaning. As with almost all public art, most people passing by do not perceive the work except on the fringes of consciousness. Most of us skim the surface of our world like water-skeeters, quickly and efficiently but never actually submerging. However, when true perception happens then participation or involvement must follow. After I took the photos, Muntadas’ words stayed with me all day and I was reminded that once we open our eyes /hearts / minds and see what is really going on in any aspects of our personal, social or political lives we can’t help but be involved, below the surface and deeper. The following information* is from the VAG and I give them full credit. The photo of ‘WARNING’ above is by clinock / the photo below is by Rachel Topham, Vancouver Art Gallery, and I thank her for it. A pioneer in the fields of conceptual and media art, Antoni Muntadas’ practice includes performance, video, photography, multimedia installations, publications, web-based projects and public art. Incorporating in-depth research and astute readings of cultural situations, his incisive works have addressed ideas such as the relationship between public and private, the role of the media in transmitting ideas, and the complex dynamics of architecture and other social frameworks. Translation and its many implications is the central theme of Muntadas’ ongoing On Translation series, started in 1995 that comprises works created in a variety of political cultural and economic contexts. These works consider the interpretation of words, concepts, histories and values not only across different languages, but also through the invisible conventions inherent in all forms of communication. On Translation: Warning is a series that calls into question the manipulation of information and encourages audiences to participate in the decoding process. 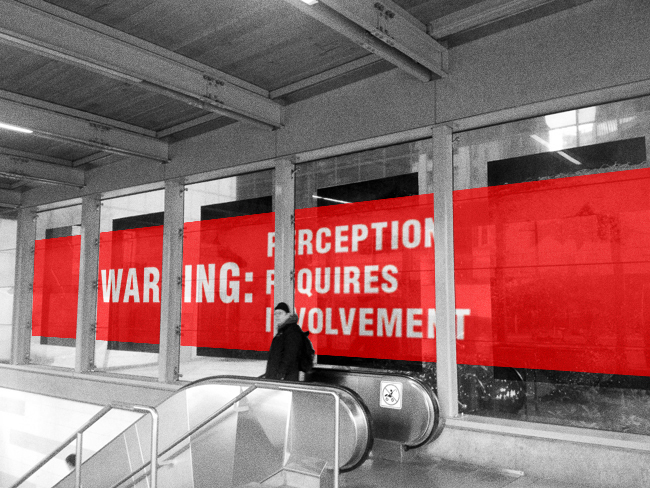 These works have been installed around the world and their common thread is the sentence “Warning: Perception Requires Involvement,” which the artist has translated into local languages and displayed using such supports as posters, stickers, press inserts, building façades, windows and other public spaces. This presentation is part of a larger exhibition of the artist’s work, Muntadas: Entre/Between, on view at the Vancouver Art Gallery from November 9, 2013 until February 10, 2014. ‘The 100′ series was initiated by my 100th Post in April 2012. As text and images are the essence of my blog my intention is to present 100 pieces of text-based art from historical and contemporary artists and from my own hand. To view the series to date click on ‘The 100’ in my Category Menu. It is a warning against cynism and other forms of lazyness I think? “Perception requires involvement” reflects that anything I become aware of, I become responsible for which is something I’ve always believed. THis to my mind does not mean for example that I have to take on feeding or donating to every person who asks but that. Become accountable for saying no. It is the difference between an active conscious decision and a passive oblivious one. I gather involvement means using all senses to perceive. We usually have a false -to me- idea that in order to perceive and understand something, we must act or always be on the move. True perception must come from total stillness and openness. I hope I’m making sense and I may be very far off from the creators idea… In any case your photo shows this perfectly with the reflection in the puddle. John I find this post impressive with your mix of the personal and the informative. Thanks for showing us the way the VAG is taking art to the people. The work does raise many questions and its scale and location draws attention. I remember a show in New York by Jenny Holzer which had a similar effect except only gallery goers got to see it. Well done!